Rohingya people who have entered India are not refugees but illegal immigrants, home minister Rajnath Singh has said, as they have not followed the due procedure to acquire a refugee status. “By deporting Rohingyas from India, we are not violating any international law. India is not a signatory to the 1951 UN Refugee Convention,” he said, adding that the argument from some quarters that India would be violating international law in deporting them is not the case. “People have entered India in illegal manner. 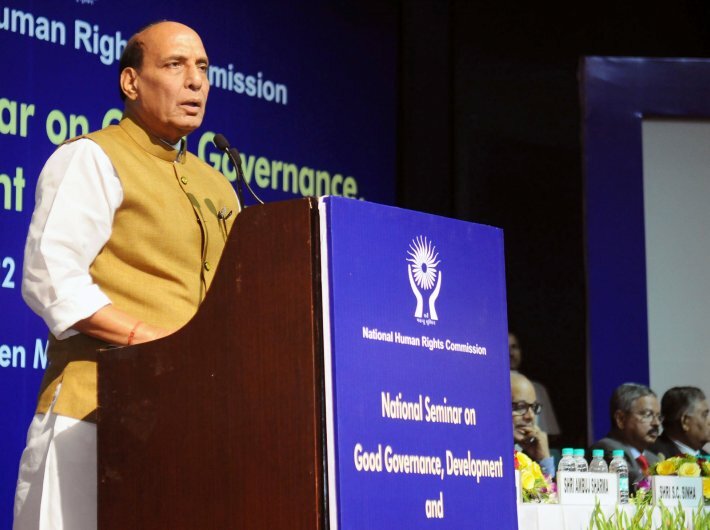 Today, we are talking about their human rights,” said the minister at a national seminar on good governance, development and human rights organised by the National Human Rights Commission (NHRC) in the capital on Thursday. He told the home ministry had filed an affidavit in the supreme court, which is hearing a public interest litigation (PIL) seeking refuge for them. “Any sovereign country is independent to take action against illegal immigrants. Rohingyas’ illegal immigration is also related to national security. People should understand the reality. Still, we have provided humanitarian aid to Rohingyas in Bangladesh. The country is equally affected by Rohingya. He said that the issue of deportation of Rohingyas for India is not a matter of ego and confrontation but of principles. Those who, in the name of human rights, are expressing concern on the rights of others should bother first for the rights of the citizens of India. The citizens of the country have the first right on its resources and not the illegal migrants. Rohingyas are illegal migrants; they are not refugees for which a process is required to be completed, which they never followed. “[Myanmar leader] Aung San Suu Kyi has given a statement on taking back Rohingyas. If India is deporting then why should people have any objection to it? Myanmar's willingness to take Rohingyas [back] is a ray of hope,” he said.